We know that we have always been very adamant about not buying your wedding dress online. And of course, wherever possible, we would still recommend that you go to some boutiques and ateliers with friends and your mom, as this is a great bonding experience for the bridal party before the big day. 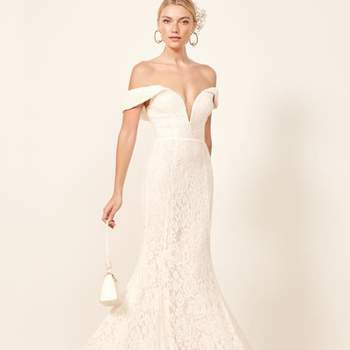 However, we also realize that this isn’t always possible – particularly for brides who are working on a pretty tight budget, or who are getting married on a spur of the moment decision, and need a dress imminently. So if you’re in a situation where you need to get your wedding dress via the internet, then we’ve found you the perfect provider. The Reformation are a millennial bridal brand who know just what women under 30 want for their big day. That’s not to say that the rest of you can’t pull off one of these gorgeous dresses – but that the inspirational minds behind the brand are young women designing for young women. And we can see that in the risqué cuts, the thigh-high splits, and the deep V-necklines. With prices ranging from between $250-$750, The Reformation have designed a range of dresses that are totally accessible for all brides – and that are truly beautiful too. They are definitely more suited to casual weddings than cathedral affairs, but the Poppy and Montego gowns could work for the latter! Not all millennial women want the same thing, and of course there are more traditional options out there. However, for a comfortable, sensual wedding dress that won’t break your bank account, The Reformation are the people to go to. Thoroughly modern – we love the two-piece Harp look (very House of Ollichon)! – but also immensely feminine, we can’t recommend this brand enough. Choose an off-the-shoulder look to tease all of your guests, or look sophisticated in a Charlie Brear-style kimono gown… We’re sure you’ll look amazing in any one of these dresses!